The musician and artist M.I.A.’s new book, M.I.A., could be called an “artobiography.” It contains a few essays written by the author and a foreword from a friend, but it’s largely devoted to M.I.A.’s non-musical and pictorial art from 2005 to 2010. M.I.A. 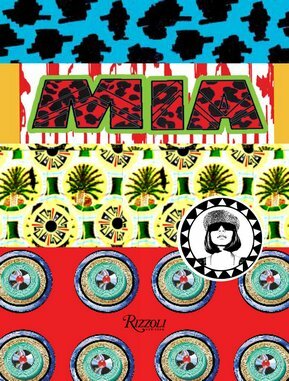 calls the book “a document of the five years of M.I.A. art that spans across three LPs,” and this seems accurate. Though the LPs will likely serve as motivation for most readers to pick up this book, the music mostly provides a jumping-off point, something to be reconsidered in light of her visual work. She managed to slip backstage at a concert and meet Justine Frischmann, a former member of the English band Suede. (At that time, Frischmann lead the group Elastica.) The musician soon invited Maya to live at her house, providing access to London’s in-crowd. Maya created some album artwork and music videos for Frischmann, while also interviewing, filming, and photographing the Tamil community in England and back in Sri Lanka. But a successful display of her work didn’t give her quite what she wanted; “dissatisfied with being a fine artist,” she moved into music, which allowed her to “represent society” to a larger audience. As M.I.A., that’s exactly what has happened. After just three albums—her first in 2005, her most recent in 2010—her career has already morphed through several stages. She exploded fast with her debut Arular, which takes its title, M.I.A. writes, “from my father’s code name. . . in the Tamil resistance movement.” At first an unknown quantity with great beats, style, attitude, and looks, M.I.A. and her music attracted unusual pop adjectives: chaotic, dense, amalgamated. Her songs tended to coalesce around momentum, a variety of electronic noises, rhythms, samples and percussion. It seemed to favor no musical genre over any other. Her second release, Kala, achieved mainstream ubiquity on the strength of the song “Paper Planes,” which she performed nine months pregnant at the Grammys, accompanied by American hip-hop royalty. Then the New York Times Magazine ran a piece that portrayed her as spoiled, impulsive, and unaware, a star spouting nonsensical radical sentiments while living the highest of high lives. (Do we see this kind of thing written about politically minded and similarly pampered male stars like Bruce Springsteen or Neil Young?) The piece also contained quotes from her ex-boyfriend and star producer Diplo, who said “She can’t really make music or art that well. . . She knows how to manipulate,” as well as statements by figures like the head of the Sri Lankan Democracy Forum suggesting her political statements were neither accurate nor helpful. The artist’s third album, /\/\/\Y/\ (the title attempts an artful rendering of “Maya”), fared better on U.S. charts than her previous releases. But sounds strayed further from the visceral rhythms that won her fans in the first place, and reviews came back mixed. YouTube removed a nine-minute video in support of her single, “Born Free,” almost as soon as it appeared—the film portrayed systematic executions. Then M.I.A. gave the world the finger during the Super Bowl halftime show. . . though she apologized the next day. So, after playing feisty up-and-comer, critical darling, and superstar, M.I.A. entered a more difficult career stage, alternating between provocative behavior—motivated to some extent by her political views but also by perceived critical slights and commercial considerations—and contrition. If the new book is any indication, M.I.A. does not seem overly concerned about these tensions. Maya writes a brief essay for each of her albums, and a few others on things she supports, like WikiLeaks. She talks little about the music on her albums, and shows no need or desire to defend or reassert herself. In her essays, she tends to string together a number of phrases she thinks characterize the inspiration for her albums. For Kala: “chaos in the streets. . . the birth of a computer in my life. . . being the first-world rap star and the third-world factory. . . life-on-the-road art. I wasn’t anywhere, I was everywhere. . . seeing beauty in the ugly. . . People vs. Money.” The clichés feel part of her performance. Still, the stream-of-consciousness riffing is largely beside the point. Now that M.I.A. has a household name, the “Paper Planes” girl, she can no longer maintain the same tight control of image, message or impact as last year’s model. Her newest album grappled with this loss of identity, and presumably her next (originally planned for a December 2012 release, it’s been delayed) will as well. Most of the book shows large photos of M.I.A.’s artwork, usually bright and vivid, often explicitly violent. She places an emphasis on stenciling and repeated motifs. One picture offers the stenciled face of a Tamil woman next to a tiger that looks to be running through a red mist of spray paint. It turns out the woman, now dead, fought to hold a bridge against government tanks. A picture of an automatic rifle shows “a weird, fucked up thing – personalizing your guns with stickers, like badges on a schoolbag.” At the end of each section, a few paragraphs comment on some of the pictures. M.I.A. has a sense of humor, taking violent slogans from hip-hop albums (Boogie Down Productions’1988 album By All Means Necessary; 50 Cent’s 2003 gangster-rap blockbuster Get Rich Or Die Tryin’) and “making them third world.” She means she changes the wording—to By All Beans Necessary and Goat Rich Or Die Frying—then places the slogans next to images from Africa or India. Along with all the art, the reader encounters plenty of pictures of the artist looking cool, several iterations of the images that grace her album covers, and shots from packed concerts and tours. M.I.A.’s war with some in the media may actually help her in this regard, allowing a publicly airing of rebellious attitudes. Meanwhile, she puts out this stylized, non-threatening book on the side, further expanding her commercial reach. Inciting revolution as a member of the elite is a tough game, but M.I.A. seems to have plenty of tricks up her sleeve. And she can always find a bottle of champagne when she needs one.